Re: Pedro, WTC, and me. Bobby was razzing his Geography teacher on the upper floor of the old school. My cousin now living in Everett, Washington and my late coach were both in his class and it must have been obvious who the white chalk prankster was. I've gotten first hand witness accounts from both men. The Pearl Harbor attack being planned "to let it happen" is a well worn conspiracy theory. I've heard them all and they can raise people's eyebrows! But the red flags flew high long before Pearl Harbor's fateful day, December 7, 1941. A red flag flew in each news maker! From the mock US air craft attack on the Panama Canal, to the USS Saratoga's mock attack on Pearl Harbor, to Churchill's Royal Navy's bi-planes attacking the Italian and French navy ships. One hour before the first bombs hit innocent U.S Navy sailors, U.S Marines, U.S. Army soldiers, Hawaiian citizens, ships and planes. Our WW I destroyer, the USS Ward and it's very accurate 5" deck gun crew, sunk an exposed Japanese mini sub just outside the mouth of the harbor! England's famous Yugoslavian double agent Dusko Popov attempted to prove to the F.B.I. 's brainless J. Edgar Hoover that in his August 1941 meeting he told the skeptical FBI CEO of knowing there would be a Japanese surprise attack on Pearl Harbor in December! It was not only our nation's leaders being fast asleep on ALL those unheeded warnings. It was also the U.S. Navy parking all their at rest battleships in vulnerable rows with war raging in China, Europe and the Soviet Union just across the Pacific Ocean! Last edited by Malaria_Kidd II on 03-16-2019 05:48 PM, edited 14 times in total. And, I'm still wondering whatever happened to the Baghdad Museum artifacts that our troops rushed to "rescue" way back when. Does anyone remember hearing about that? As I recall the story, while our troops were rushing through Saddam's forces, another group rushed ahead to the Iraqi Museum - which, on it's face, seems kinda odd...... until you factor-in some of the Zecharia Stichin stories regarding the region. Did the NeoCons find what they were looking for???? Right kbot! The Gulf of Tonkin incident's "reason" seemed to mirror dead concentration camp prisoners dressed as Polish soldiers scattered around a German radio station near Poland's border. I'd not seen that video kbot. Was it an inside (theft) job? One would not want to compare our troop's leaders to the Nazi ZZ. As arrogant silver "Jolly Roger" hat pin wear'in pirates pillaging Europe's treasures in WW II. I was not aware that our troops were headed there to stave off the BM's inevitable looters. The whole city was a free for all for the "grabs" condition lurking inside the average human. Hey kbot! I just looked up! Now I now how to embed a video. You've made my day all the way from back East! Last edited by Malaria_Kidd II on 04-22-2018 01:11 PM, edited 2 times in total. Stichin's works concerned his translation of early Sumerian tablets and their similarity to early Hebrew OT stories, such as Genesis. He felt that the Genesis story was a later retelling of a far older story that spoke of an alien race that had left their world to come here in order to mine the Earth for minerals which were to be used on their home planet. The Epic of Gilgamesh also is mirrored in these texts. In order to mine the needed minerals, Stichin contends that the texts refer to the alien race making genetic modifications to the existing pre-homo sapien race then inhabiting the Earth, and used them basically as slave labor. His view is that these pre-Canaanite stories also seem to parallel the ancient Indian mythic tales of warfare fought in the skies, such as the Mahabharata, Ramayanaand and the Bhagavad Gita. kbot wrote: Stichin's works concerned his translation of early Sumerian tablets and their similarity to early Hebrew OT stories, such as Genesis. He felt that the Genesis story was a later retelling of a far older story that spoke of an alien race that had left their world to come here in order to mine the Earth for minerals which were to be used on their home planet. The Epic of Gilgamesh also is mirrored in these texts. In order to mine the needed minerals, Stichin contends that the texts refer to the alien race making genetic modifications to the existing pre-homo sapien race then inhabiting the Earth, and used them basically as slave labor. Many thanks for your great information kbot! It's no wonder we rushed to get there first! When conditions before 1979 were better one would think there would have been plenty of time to investigate ancient artifacts in the museum. The new kids on the big block have been breaking up everything ancient Roman to ancient Sumarian up North of Baghdad! But it reads like his theories were waaay more ancient! I might subscribe to ET fooling around with our genetics for slave labor to mine minerals. But slaves mining earth's gold to improve "their" far away ailing atmosphere was always very hard for me to believe. Last edited by Malaria_Kidd II on 04-17-2016 12:39 AM, edited 1 time in total. Besides the Mideast, allegedly, there were also sites in South Africa where activity took place, long ago, which may (again, speculation) lead to the "missing link", that scientists have been struggling to find. Interestingly, the dates appear to match-up, if only loosely, which is intriguing in and of itself. Very well said and duly noted kbot. Zacharia was on Coast long before I was a regular listener. I regret not hearing him and Art Bell together. I need to get ready for trucking Highlander crumple zone steel 26.5 miles for the big puzzle that makes that mid sized SUV. I still call em trucks! Last edited by Malaria_Kidd II on 12-03-2015 11:56 AM, edited 1 time in total. I typed an "a" instead of an "I" in my second line......I like being able to edit my bad grammar and misspelled words 24-7! That's like the UK's Mysterial but Mark Elvidge - Administrator has no "Last edited by: line I am a lone ghost there folks! Archives at Coast for Coast Insider's go back just five years kobot. Would he have any You Tube videos "out there"
Bedtime for me is now! Last edited by Malaria_Kidd II on 03-04-2016 11:06 AM, edited 1 time in total. Re: The ScFi Channel's Beyond Belief - Graffiti! Here is the Syfy Channel's version of our young citizen's legendary message actually meant for his second story classroom's Geography teacher. His or her red tongue wagged it towards Bobby just a bit too much on December 6, 1939. Teacher's should never make examples of their students. Paddling is no longer allowed in any American school and neither should there be razzing of the singled out kid so young or in their teen years! Thursday morning I sent my cousin's name and address to C2CAM to possibly have him on the air on Monday night's show on the 7th. The subject line should have peaked their interest. But my luck with C2CAM has never been much to brag about over the years. For well over a month I had a mystery going right here that Twitter members or my followers never made a stab at solving. So I deleted it two weeks ago. See if you can solve it and it's there in black and white under the comments. But you have to read all of them, the newer ones that is. I guess I jumped the gun by sending you to solve a mystery at You Tube. I deleted that short paragraph when I took it off my Twitter page @Malaria_Kidd. Oh well. With your help we can keep Bobby's legend alive and moving along if there is a continued interest here. BTW Paranormal is not all that popular for visitors found in "Who is online". I look there a lot and I've seen just two guests visiting "Above Normal!" This is what I wrote after my first view of that 1998 Syfy Channel video based roughly on our local boy's legendary chalked OHS sidewalk message to razz his Geography teacher upstairs! I posted this in a select few UK paranormal sites and at Joshua P. Warren's Speaking of Strange discussion board @ his L.E.M.U.R. Team web site. Due to our major news channels covering the usual tabloid stories, I channeled on. Right next door to CNN is the Chiller Channel. The show highlighted on our DVR's top line was, "Beyond Belief-Fact or Fiction". I said to my wife, "Here is that old SYFY show." I knew it was being repeated but I had not set it up to record each show on Saturday evening. A barrage of commercials* had just ended. The shows host was walking into a darkened room. The shows theme was "evil" things reported. He walked up to a 3 X 3 wood form filled with wet concrete. He took a curled stick and began to draw his initials in the dark grey concrete. I thought to myself, maybe this is the show from 1998! My son was chatting with his lady college friend who came to visit him from Indianapolis. My wife was sitting behind me at the PC Scrabbling away. I started yelling, "This is it! Come and look son. Jessica look at this!" The next scene showed the words "REMEMBER PEARL HARBOR" etched in wet cement on a sidewalk. To make things short now. The short account of our local legend was well acted out like they all are these days. At the end of the show the host recounted each skit for a "Fact" or "Fiction." REMEMBER PEARL HARBOR" came to be a "Fact" in another place and time not mentioned to protect the totaly innocent, eh? Evil in nature? Not a chance SciFi Channel! I was amazed to catch this! Truly amazed at my timing catching this old show that recently came on in repeats! I say the whole show came from Frank Edwards book which can still be purchased at Amazon. "Strange World True Events - so fantastic and amazing as to baffle the most brilliant scientific mind!" page 191 for "Fateful Forecast"
Now I know some of you have seen this on the SciFi Channel back in 1998. Let me know all about it if you saw this on the UK's Sky Channel. Note the "my" above comment entered at Wikipedia was on line for over two years before it was "found by 2 prude moderators" and then deleted many times, then I'd replace it, until this truth became an "edit war" between Wikipedia and me! I just wish my friend can watch this video. He is a big war enthusiast and I told him this story. He claims it never happened because there was no proof of this anywhere else. Maybe this could change his mind. Last edited by Malaria_Kidd II on 02-04-2018 09:59 AM, edited 14 times in total. Nick Schneider recently received an interesting letter from a man who lives in Maryland who wondered if a story he read about in two separate books really did happen in a small southern Indiana town. Nick read the letter to the town council and he hoped to get first hand information to send back to Maryland. The citizens talked about the writing that winter morning in December, 1939. What did 'Pearl Harbor' mean? They never figured out who painted the words or why. It seemed just a prank or some mindless vandalism, and the incident was forgotten - until the Japanese bombed Pearl Harbor on the exact day - two years later "
That article was by Nick Schneider from The Star Times in June of 2005. 0755 hours	At the Command Center on Ford Island, Comdr. Logan C. Ramsey looks out a window to see a low-flying plane. A reckless U.S. pilot, he thinks. Then he sees “something black fall out of that plane” and realizes it’s a bomb. Were those chalked words just a coincidence Or just a sadly ignored "God wink" as penned by author SQuire Rushnell, a former guest on Coast to Coast AM many years ago. Last edited by Malaria_Kidd II on 11-04-2018 11:50 AM, edited 5 times in total. Re: The view count is upping nicely! 9 / 11 / 2001 Esp: A Freaky Prediction Comes True There are a lot of people with the ability to accurately predict or sense future events. Sometimes the event is world-changing, and other times it's just a personal event that we sense is going to happen. One true story is that the fate of the attack on Pearl Harbor in 1941 was predicted by a high school student who wrote the words "Remember Pearl Harbor" as graffiti all over the school's walls, and even on the principal's automobile, one week in advance. There are also countless other predictions that have been told about our own generation's disaster of September 11th, 2001. Last edited by Malaria_Kidd II on 09-26-2017 03:11 PM, edited 2 times in total. You know the OP's topic well. It's Dr. Carl G. Jung's "synchronicity"! joequinn wrote: Question: has anybody begun to do some systematic investigation about the paranormal phenomena that surround the events of 9-11? I have heard bits and pieces, but nothing substantial. I strongly suspect, however, that there are many paranormal events at the site that people are keeping to themselves. And for good reason too. The former site of the World Trade Center is already a shrine of secular pilgrimage, and the authorities cannot afford to allow any trace of the paranormal to reveal itself there because of its inflammatory effects on the public. But I am sure that the place is haunted as hell. Does anybody have any information on this subject that he or she can share with us? Thanks in advance for sharing. Hi again Joe and I hope eventually here you'll go! As tempting as it is, you'll never see a similar version of this posted at Scotland's home to Unexplained Mysteries! Do some bumpin'! The owner/administrator Madmart is nearly blind with glaucoma. He drove a double decker bus for a living. This same UK mysteries thread on 12/7/41 vs 9/11/01 has 23K bumps too! Just scroll down to the second topic. 12/7/41 "The sun that burned a fiery red" Watch for that line! The album from 1987 is 'A Momentary Lapse Of Reason' by Pink Floyd. The English rock music legend icon was given the first names of two Americans by the late Syd Barrett of Cambridge, England. The two men were beloved blues men Pinkney "Pink" Anderson and Floyd Council from Georgia, USA. Rock and roll historians say Syd saw their album and liked it. Pink Floyd has 9 letters and their album has 10 tracks but actually 11 songs. The New York Lottery Pick 3 for 9/11/01 was 9-1-1. After the jihadists attacked many found those two numbers in many connections. An Evansville Courier paper in 2004 mentioned this; West Point Military Academy's graduating class was called, 'the class of 9/11'. There were 911 graduates. 7 out of 10 new officers will be in Iraq and Afghanistan very soon fighting terrorism. 'The Dogs of War' is a very prophetic song that possibly put the islamofacist's story on the 'air' 21 years ago. "Hollow laughter in marble halls." I saw Ian's "red flag"! All of the lines below seem sadly missed after the February 26, 1993 One World Trade Center terrorist attack.That day WAS our 1st warning that the complex was likely to be attacked again in the future! There were so many strange unheeded warnings before 9/11/01 just like Pearl Harbor had before December 7, 1941. I live in the small Indiana town where the words "REMEMBER PEARL HARBOR" was found in chalk the morning of December 7, 1939. That is another story seldom heard for good reasons. These song titles WERE NOT RELATED, but could be easily related to 9/11/01. 1. SIGNS OF LIFE * Any cities tall buildings as seen from an airplane. 2. LEARNING TO FLY * What a jihadist had to learn to do. 3. THE DOGS OF WAR * What jihadists are doing now. 5. ON THE TURNING AWAY * United Airlines Flight 93 was turned away from our White House or the US Capitol Building in Washington D. C.
6. YET ANOTHER MOVIE * Fahrenheit 911? note; this Michael Moore movie blacked out the city's un-precidented terror attack on skyscrapers. 6a.ROUND AND ROUND * An age old description of a fight. Aboard United Flight 93? 7. A NEW MACHINE Part 1 * An airplane is a flying machine/ WTC Tower 1? 8. TERMINAL FROST * Coldhearted jihadists departed from an airport's terminal. 9. A NEW MACHINE Part 2 * WTC Tower 2? 10. SORROW * This title relates to 9/11/01 but are the spooky lyrics futuristic in nature? The lines for 'Sorrow' are below here. "One Slip" is studied even further on page 5! Many rock bands have an "atom bomb" mentioned in their songs. Sorrow maybe Pink Floyd's thoughts about that, in lyrics. Could these syncs be something compared to Nostradamus's Quatrains? The Bible Codes? Pink Floyd's album The Wall with it's songs 'Mother' and 'Run Like Hell' was on Clear Channel Radio's "No Play List" in the New England area. Was that because Pink Floyd mentioned, "Mother do you think they'll drop the bomb?" Many other songs were on the list, and we wondered why. Some were obvious with Van Halen's 'Jump' and not so obvious with Bobby Darin's 'Mack the Knife'. Definition of synchronicity from the 1920's, It's the designed parallelism of time and meaning between psychic and psycho physical events. A quote credited to Dr. Carl Gustav Jung, the famed Swiss psychologist. Again, the Pink Floyd's synchronicities above were in millions of homes around the world. Here, the UK, the world over music fans are always seeing, at times, hidden messages in lyrics. Some are hidden on purpose and some are there by pure innocent coincidence. I doubt anything prophetic was envisioned to inspire this music. Unless it was a God wink or channeled by an inter-dimensional being/time traveler! Pink Floyd does dedicate some of their music to World War II. Who would of thought song titles would tell anything prophetic? Now all yet another movie for Hollywood's let- time-slide and money. Pink Floyd's name is American in origin. "When God winks" by SQuire Rushnell is his well received book that mentions the HMS Titan in 1898 vs the HMS Titanic in 1912 and the Lincoln & Kennedy life and death parallels sometimes called Tecumseh's Curse! 'A Momentary Lapse Of Reason' by Pink Floyd was recorded in Los Angeles, California and on Astoria, a large house boat sitting in the River Thames in late 1986 & early 1987. But wherever you go, you know they’ve been there before * I. E. D.'s? One world... One world... One world... One world... One world... One world...One world...One world. Now add these two words in the second line above; "trade center" The Twin Towers were called One World Trade Center and Two World Trade Center. For a chill ponder on the present goal of the ISIS Caliphate! No interpretations were needed there. I think it's all prophetic to say the least. Who wins in this 1,400 year old war? The dogs of war are another name for mercenaries, but they don't usually have the world as their battleground. Why would they want to smash it down? Islamofacists do want peace in their one world. Edited on Wednesday November 20, 2008 with an addition from FOX News getting credit..
Al-Zawahiri said Obama's election has not changed American policies he said are aimed at oppressing Muslims and others. "America has put on a new face, but its heart full of hate, mind drowning in greed, and spirit which spreads evil, murder, repression and despotism continue to be the same as always," the deputy of Al Qaeda chief Osama bin Laden said. He said Obama's plan to shift troops to Afghanistan is doomed to failure, because Afghans will resist. "Be aware that the dogs of Afghanistan have found the flesh of your soldiers to be delicious, so send thousands after thousands to them," he said. Al-Zawahiri did not threaten specific attacks, but warned Obama that he was "facing a Jihadi (holy war) awakening and renaissance which is shaking the pillars of the entire Islamic world; and this is the fact which you and your government and country refuse to recognize and pretend not to see." David Gilmour talking about 'Yet Another Movie' taken from 'Only Music', December 1987 : "It's a more surrealistic effort than anything I've attempted before. I don't even know what all of it means myself." Hollywood said it would never make a movie about 9/11/01. I did not believe that one! Fahrenheit 911 was yet another movie in all 11 tracks together as a 9/11 prophecy. There were many prophecies of that day. Here below in music lyrics is a huge irony, and this is only my opinion once again. *Denotes my opinion, and again I'm adding this dis-claimer that these fine lyrics are NOT related to September 11, 2001 and the human tragedy in *** **** ****. "Has anyone ever thought about the parallels of this song to OJ Simpson and the murders of his wife and Ron Goldman, just listen to the lyrics, kind of eerie." With a simple interpretation line by line, now read how eerie and prophetic it could be! One sound, one single sound * 1 Jet engines overhead. One kiss, one single kiss * 2 A goodbye kiss. A face outside the window pane * 3 A terrorist crashing an airliner; later they all were 19 faces in the news. How it ever did come to this? * 4 A fitting question to 9/11/01. A man who ran, a child who cried * 5 The survivors of 9/11 in *** **** ****. A girl who heard, a voice that lied * 6 Many voices lied then and now. The sun that burned a fiery red * 7 Is this related to December 7, 1941? Imperial Japan's war planes attacking Pearl Harbor carried a fiery red sun! The vision of an empty bed *8 800 empty beds are on the album's cover. The use of force, he was so tough * 9 O.B.L.? She'll soon submit, she's had enough * 10 America's will; is it strong enough? The march of fate, the broken will * 11 The WTC seemed to be doomed. The terrorist mind-set of the US intelligence agencies; the major airlines CEO's long history of hijackings; And a lapse of reason it all was! He's not the worst, he's not the best * 12 Heaven has no ranks, and he's just the same as all the rest. Any one of the 343 FDNY firefighters lost that horrible day. 'God Bless' all who died so tragically. And still this ceaseless murmuring * 13 Conspiracy theorists abound; with their books, on radio, on TV. Seas of faces, eyes upraised * 14 The *** ******* on the streets that day. The empty screen, the vacant look * 15 The WTC's towers falling on live television, and the look of Ground Zero many days later. A man in black on a snow white horse, * 16 S.H.? A pointless life has run its course, * 17 Is O.B.L. dead or alive? Remember all of the painted Iraqi WTC plane crash murals?? 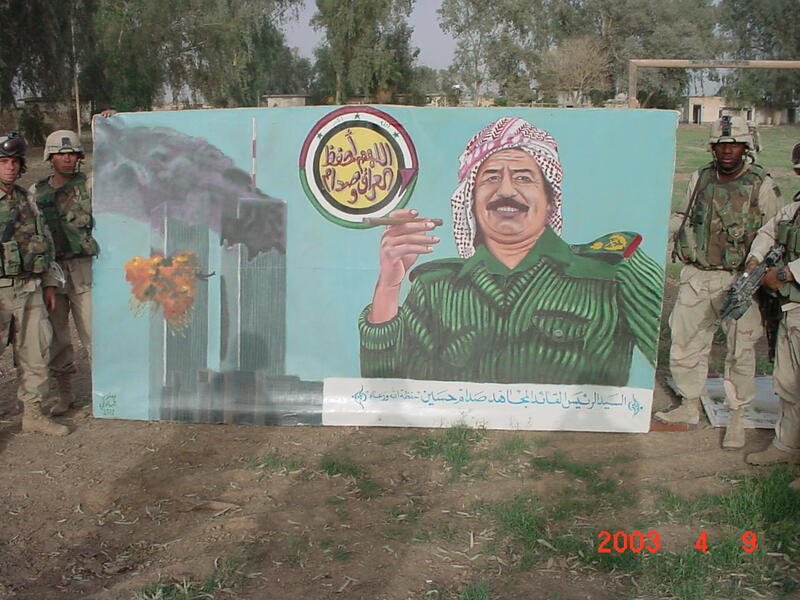 There is Saddam Hussein smiling beside the burning Twin Towers. They said Iraq was not involved but maybe the dictator or just his 2 sons were! Dead men tell no tales. The red rimmed eyes, the tears still run * 18 Our eyes and our tears still run. As he fades into the setting sun * 19 edited redo: O.B.L. is NOT seeing the sun now! ; S.H. has seen it for the last time. The lines just above were taken from Humphrey Bogart and Engrid Bergman's airport scene in the Hollywood movie 'Casablanca'. I was painfully aware that the “camel in the room” was totally ignored. The threat of militant Islam never came up, even though it is at our doorstep. The voices in the wilderness will be drowned out as always, until the prophecies come true, and then people will ask in amazement, “How did it happen?” How does one then begin to explain the slow, deliberate, evil progress of a destructive force? Watch for the 2 tall structures awash in blood?!! The bloody hands are waving "good-bye" towards two tall shapes resembling skyscrapers! This video is not the official version but it's a mix of other Pink Floyd videos. The night after 9/11/01 when Ian Punnett read all the track's titles from 'A Momentary Lapse Of Reason'. The last Open Lines caller referred to "Sorrow" from Ian's earlier read on Coast to Coast AM. "Plumes of smoke rise and merge into the leaden sky" was his quote. In *** **** **** that sad day the skies were clear blue. Dedicated to the late Rick Rescorla. "The Man Who Predicted 9/11"; at The World Trade Center on The History Channel's documentary. THE USE OF ANY COPYRIGHTED MATERIAL IS USED UNDER THE GUIDELINES OF "FAIR USE" IN TITLE 17 § 107 OF THE UNITED STATES CODE. SUCH MATERIAL REMAINS THE COPYRIGHT OF THE ORIGINAL HOLDER AND IS USED HERE FOR THE PURPOSES OF EDUCATION, COMPARISON, AND CRITICISM ONLY. NO INFRINGEMENT OF COPYRIGHT IS INTENDED FOR THE SOLE PURPOSE OF A "JUNGIAN EDUCATION"
Spend some time in dusty, seldom visited Paranormal and you may agree or disagree on the multiple parallels. Or as he explained coincidence, Dr. Carl Jung penned his new word "synchronicity". I have no plans to tell the above on any late night alternate news radio show. The show's directors would be required by me to play whole songs. Where's my steadfast lead balloon reserved for that idea! Some day in the future if any member interested in The Floyd and "synchronicity" do post noting any specific lines above. In time there will be more to write on these two infamous dates of 12/7/41 9/11/01 that I did not tell Ian on Coast to Coast AM in the wee hours of November 26, 2001. Last edited by Malaria_Kidd II on 03-16-2019 06:05 PM, edited 47 times in total. Would adding my ball coach and Health teacher's name with his quote help? I doubt that. Would entering my cousin's name as another witness make a difference? I doubt that too. The only links on this true account would take you to mysteries web sites with my efforts mostly. I keep Robert W. Roll's message/memory alive on the Net. I am really surprised it's been deleted about 6 times! The truth hurts with or without references/reliable sources! A mistake it is to delete his legendary note from a small town who's citizens are mostly familiar with our legend. It's been in our papers. It's been told by the late great Paul Harvey, it's been in magazines, on the radio, on TV. It is verified, big time! Please leave my freshest line in memory of Robert W. Roll the then sixth grade boy who wrote the message. MK Cody 4 blocks east of that old sidewalk. Your recent editing history at Owensville High School shows that you are currently engaged in an edit war. To resolve the content dispute, please do not revert or change the edits of others when you are reverted. Instead of reverting, please use the article's talk page to work toward making a version that represents consensus among editors. The best practice at this stage is to discuss, not edit-war. See BRD for how this is done. If discussions reach an impasse, you can then post a request for help at a relevant noticeboard or seek dispute resolution. In some cases, you may wish to request temporary page protection. My reply to Sjo that shows two tiny dots above the o! You can't undo U.S. History all the way from Sweden. An edit war you say?, it's the actual prediction to the start of America's entry into World War II two years prior, noting the exact month and exact beginning day! It's about facts too spooky for you the volunteer editor all the way from Sweden named Sjo is it? You could be busy removing curse words that I have witnessed more than once! For the life of me I cannot understand your collective actions taking this fact away from OHS history! The school's gone but Robert's legend lives on not to any thanks given to Wikipedia's volunteer editors! Edit war? I've posted your war in many places where I keep our local resident's true legend alive. Your volunteer efforts must have been watching and waiting for a "red flag" for more action under OHS. What you don't know is the few lines you removed were posted under OHS for 2 years. My living cousin was a witness to the strange prediction to the exact month, the exact day, and the exact time of 0755 when the call to classes bells were heard two years prior to the first bomb hitting Pearl Harbor at 0755 on December 7, 1941! So many red flags were flying long before that day. And you just removed one of them from the history of OHS at Wikipedia! I will try using proper channels to get this legend posted in brief again. So I hope you will be notified to leave this alone. Coretheapple, another Wikipedia volunteer, once admitted she or he might have made a mistake. You've also made a mistake in your deletion so quickly this day. Good luck to Sweden, Holland, Germany, Austria, Hungary, France, and England! Your countries are very slowly being over run by M.E. immigrants so ready and willing to harm all eventually. You cannot edit your new neighbors away, sadly you cannot. CJW - living 4 city blocks East of the old OHS location. After trying once again, then seeing tonight's fast arriving bad luck, to post Robert's message to his Geography teacher on the top floor. Again my cousin and my late coach were his classmates and witnesses telling me this true report. I have never edited away anything on the OHS page. This page was last modified on 24 January 2016, at 10:16. Last edited by Malaria_Kidd II on 11-26-2017 08:00 PM, edited 2 times in total. http://www.thehum.info/ Wikipedia's closed minds won't allow entries about this either. Coast to Coast AM last night! First half guest Dr. Glen MacPherson has researched and documented a Hum heard by people all over the world. The sound is louder indoors than outdoors, and louder late at night than during the afternoon. In the more serious cases, the Hum can affect quality of life; in a number of documented instances, the torment of the noise has been life-altering. MacPherson shared the latest from his scientific investigation into the phenomenon, which seems to indicate that the culprit may be electromagnetic pollution by Very Low Frequency (VLF) waves. This was followed in the second half by Open Lines. Dr. Glen MacPherson talked at length about his ongoing battle at Wikipedia! My battle has lasted over two years. Let's all stop visiting the place due to lack of interest! The site is called a free dictionary and encyclopedia all rolled into one. They ask for donations 24-7. If those prudes that run the place had been smart enough to require a small yearly subscription fee?.....enough said! The good doctor wants the place slammed with requests to file the "hum" heard world wide. I wish him luck! Last edited by Malaria_Kidd II on 03-27-2016 05:36 PM, edited 2 times in total.